Eddie Murray was born on Friday, February 24, 1956, in Los Angeles, California. Murray was 21 years old when he broke into the big leagues on April 7, 1977, with the Baltimore Orioles. His biographical data, year-by-year hitting stats, fielding stats, pitching stats (where applicable), career totals, uniform numbers, salary data and miscellaneous items-of-interest are presented by Baseball Almanac on this comprehensive Eddie Murray baseball stats page. Here's a challenge for you: Can you identify Eddie Murray's best season? His best season was probably 1984, when he hit .306 with 29 homers, 110 RBI, and led the league in walks (107) and on-base percentage (.410). But I'm not really sure that's his best season; his best season could be 1980 when he hit .300 with 32 homers, 116 RBI, or 1981, when he led the American League in home runs and RBI (although he strike kept his numbers low, or 1982 (when he hit .316 with 32 homers, 110 RBI), or 1983 (when he hit .306 with 33 homers, 111 RBI), or 1985, when he hit only .297 but drover in a career-high 124 runs, or 1990, when he hit .330, almost leading the National Leauge in batting average, despite playing in Dodger Stadium. His best season could be 1978, or it could be 1995, when he hit .323 and helped Cleveland to their first American League pennant of the modern era. His best year was every year. He never won an MVP Award - but he was an MVP candidate every year. 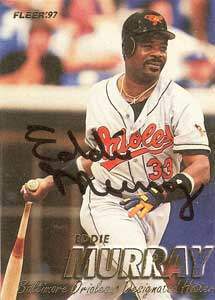 Eddie Murray is one of five players ( Hank Aaron , Willie Mays , Rafael Palmeiro , and Alex Rodriguez are the other four) in Major League history in both the 500 Home Runs Club and the 3,000 Hits Club . In the fact above, Bill James wrote, "He never won an MVP Award - but he was an MVP candidate every year" and here is a breakdown of how close he actually got: 1978 (8th, 13%), 1979 (11th, 6%), 1980 (6th, 27%), 1981 (5th, 35%), 1982 (2nd, 57%), 1983 (2nd, 74%), 1984 (4th, 50%), 1985 (5th, 33%), 1990 (5th, 37%). A nine-time "Almost MVP " who did get named to an All-Star team eight times, won three Gold Gloves , three Silver Slugger Awards , finished his career second in grand slams (with 19, behind Lou Gehrig , 23), first in home runs from both sides of the plate (with 11, since passed by Mark Teixeira ), and was a first ballot Hall of Famer in 2003 (85.3% of the vote). Exactly one baseball player has taken the field at first base more than 2,400+ times, and that player is Eddie Murray. Rounding out the top ten are Jake Beckley (2,380), Fred McGriff (2,239), Mickey Vernon (2,237), Todd Helton (2,178), Mark Grace (2,162), Cap Anson (2,152), Rafael Palmeiro (2,139), Lou Gehrig (2,137) and Charlie Grimm (2,131).